For maximum convenience, and especially for large items. 1 Fill machine with enough hot water for fabric to move freely. Add liquid or pre-dissolved powder dye; agitate to mix. 2 Wet fabric in hot water. Uncrumple and add to dyebath. 4 Rinse in cold water until water runs clear. Wash deep shades in warm water with mild detergent. 5 Dry item in dryer or hang to dry. 6 Clean washing machine using highest water level with hot water, detergent and 1 cup chlorine bleach using complete wash cycle. Clean lint traps. Plastic or rubber machine parts may be tinted but will not stain laundry. I used an entire packet of powder Rose Pink #7 dye and definitely had enough room in the washing machine for another pair of shoes or several T-shirts. I washed the shoes in the dye for the entire prescribed 30 minutes; I am guessing that I wouldn’t have achieved a more bold pink color by dying them longer. 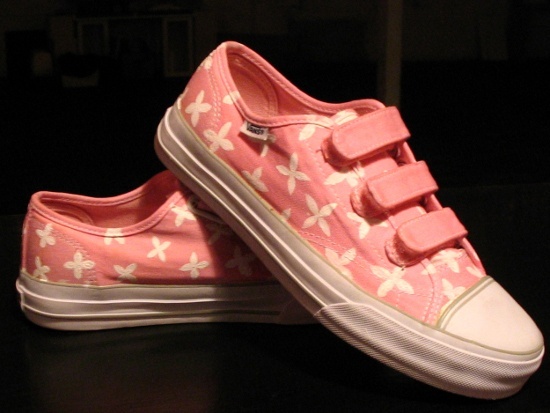 All of the fabric, including the insoles and velcro turned pink. After drying for several days, I added the white flowers using a very small amount of fabric paint and a small paint brush. The brush had short (1mm), stiff bristles that allowed me to apply the paint onto the canvas. I found I had better resolution by applying several very thin coats of paint; I was almost scraping the paint onto the canvas rather than slathering it on. By being sparse with the paint, the drying process took less than 2 hours. The finished product looks quite professional from anything more than a foot away. The shoes almost look as if they are made of flower-print fabric. Close up, it is evident that not all of the flowers are the same shape and that they are painted on. For a first attempt at DIY dye and fabric paint, I am quite impressed. This won’t be the last time I try something like this. Nice job Jason.. For that DIY project, you’ve earned some more free Flexcar t-shirts! PS.. Will you dye mine pink and paint on flowers? Or possibly batik it with clouds on a light blue background?